Being a Chinese, rice has always been something I could never give up on (no matter how desperate I am trying to lose weight). Eating other carbohydrates like potatoes or pasta doesn’t even come close to the feeling I have when eating rice. I feel content whenever I have a bowl of plain steamed rice in hand that accompanies my meal. Apparently eating rice is not unique to the Chinese culture, rice plays an integral part in Italian cuisine- arancini (fried rice balls), risotto, to name but a few. Risotto is a staple of my culinary repertoire. Making risotto always reminds me how meditative cooking can be. My mind feels free to wander while my hands busy themselves with stirring the stock-rice mixture, truly empty of everything that had concerned it before. This tasty dish combines the sweetness of pumpkin and salty taste of parmesan cheese to create a sensational bang. Hope you like this recipe and have a mindful cooking experience tonight! 2. Cut the pumpkin into 1cm dice or puree it. 3. Heat butter and oil together in non-stick pot. 4. Gently cook the onion and garlic until they soften. 5. Add the rice; stir until the rice is coated with the oil mixture. 6. Cook this for about 1 minute. 7. Add in the pumpkin. 8. Pour over 1 cup of the stock. 9. Cook, stir until the liquid is almost all absorbed. 10. Cook with a gentle simmer, smash the pumpkin with a fork while cooking if you had not pureed it in step 2. 11. Continue stirring and adding stock one cup at a time until the stock is all absorbed and until the rice is al dente- tender but still very chewy, and most of the liquid has been absorbed. 12. 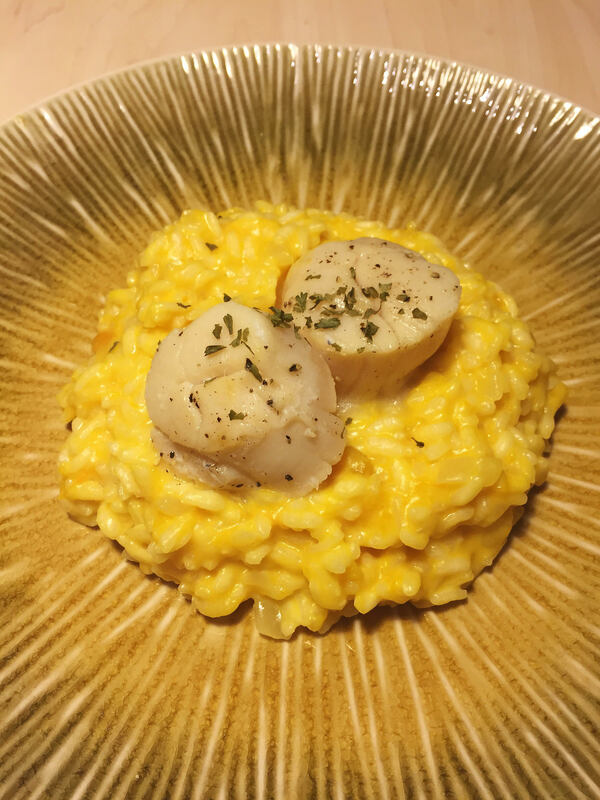 Switch off the heat and stir in the parmesan cheese and salt to give the risotto a nice, creamy finish. 1. Add the butter and oil to a saute pan on high heat. 2. Pat dry the scallops and season with salt and pepper on both sides. 3. Add the scallops once the fat begins to smoke. 4. Sear the scallops for 1 minutes on each side. 5. The scallops should have a golden crust on each side while remain translucent in the center. 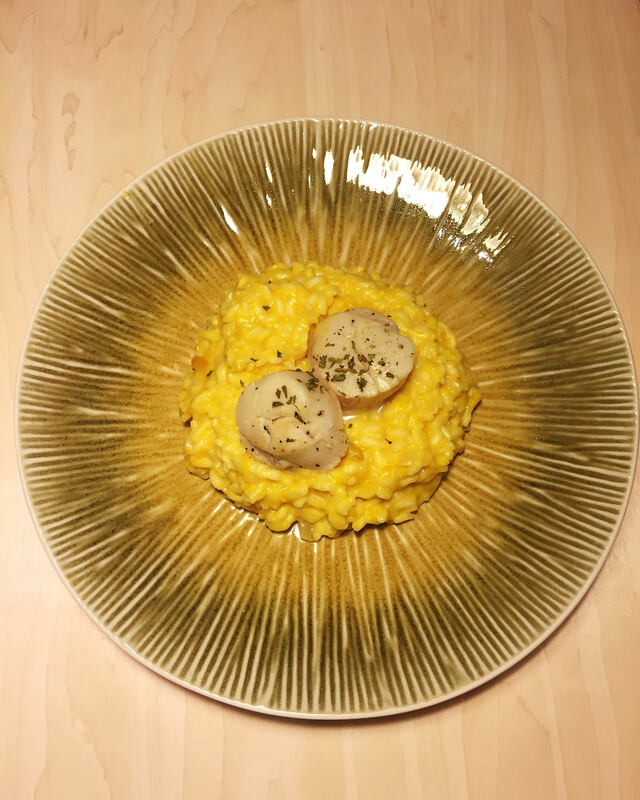 This entry was posted in Recipes-cooking and tagged dinnerrecipe, pumpkin, risotto by missamateurchef. Bookmark the permalink.